Today, New York-based startup Aviary unveiled a free suite of photo-editing tools that can be easily added to any iPhone or Android app within minutes, instantly transforming the services into fully baked mini-mobile-Photoshops. Just a couple of apps dominate the mobile photo-sharing landscape. That’s because they either have massive reach (à la Facebook and Flickr), or offer unique, proprietary tools to attract users (à la Instagram, which boasts a dozen or so one-click filters that have helped rocket the startup to 10 million-plus users). But today, Aviary is evening the playing field. The New York-based startup unveiled Tuesday its software development kit, or SDK, a free suite of photo-editing tools that can be easily added to any iPhone or Android app within minutes, instantly transforming the services into fully baked mini-mobile-Photoshops. That means every app maker, regardless of size and resources, now has access to embeddable tools that allow them to compete against the largest giants of the photo-sharing space. 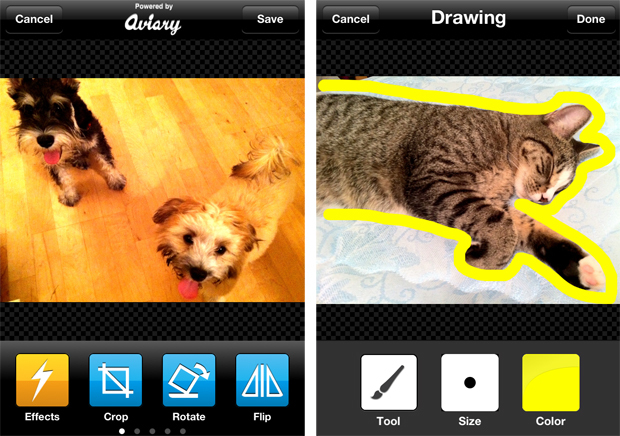 Considering that current mobile photo-editing tools have offered less capabilities than MS Paint, Aviary’s SDK is a welcome and disruptive technology for both users and developers. On the user end, features include: auto-enhance, cropping, rotating, sharpening and blurring, redeye reduction, teeth whitening and blemish removal, adjustment of color, saturation, brightness and contrast; there are also options to add stickers, text, and even to draw on top of images. For developers, that’s a tremendous resource saver, enabling them to build a new layer of functionality right into their app. And recognizing that devs might not want to integrate every feature for fear of overwhelming users, the tools and UI can be fully customized to fit any app design. At launch, more than 30 partners have signed on to Aviary, including Pixable and Picplz, and the company just recruited Paul Murphy, a veteran of Microsoft, as VP of biz-dev to help recruit more partners going forward. 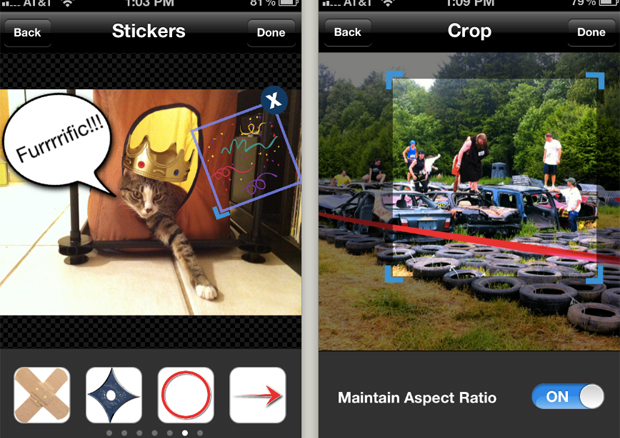 Aviary hopes to become the backbone of photo-sharing apps–not an app itself. The service is free for now, but down the road, the startup says it could potentially offer premium tools and effects. “Editing tools are difficult to build and maintain–we’re focused on that solely,” Taub says. What impact will this have on the photo-sharing space? Will this democratized technology detract from the unique proposition of apps like Instagram, which counts filters as its core selling point? Aviary CEO Avi Muchnick disagrees. “It’ll probably have a positive impact on Instagram,” he says, citing how the service could embed more tools from Aviary to enhance the app. And that’s exactly Aviary’s aim.